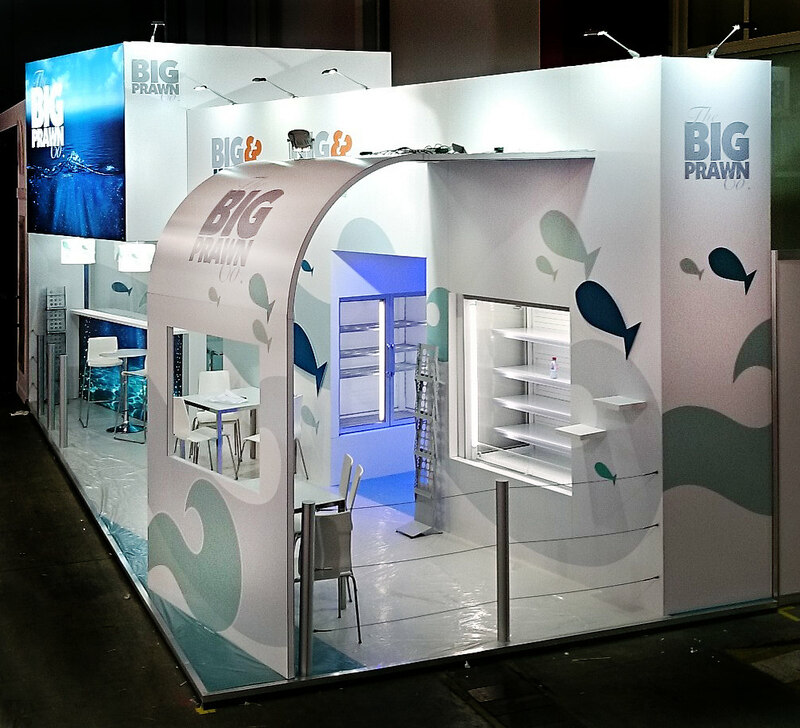 We were delighted when Norfolk-based business, The Big Prawn Company commissioned GGS for the fourth year running to design and build their Exhibition Stand at the European Seafood Exhibition in Brussels. The European Seafood Exhibition, the largest seafood trade exhibition in the world, offers companies the ideal opportunity to show off their amazing products to thousands of visitors. 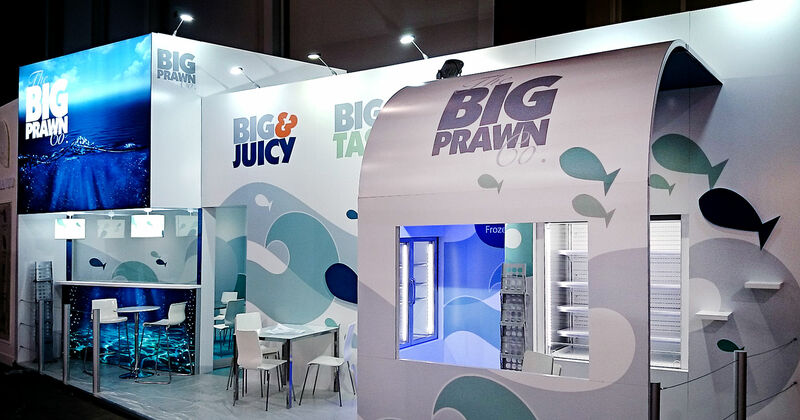 The new Big Prawn stand, at 4 meters high, covers an impressive 40sq meters as well as incorporating two striking light boxes, a stylish meeting room and plenty of seating space. With a forever growing range of products, we built in a fridge and freezer so they can easily display all of the delicious sea food they have to offer. 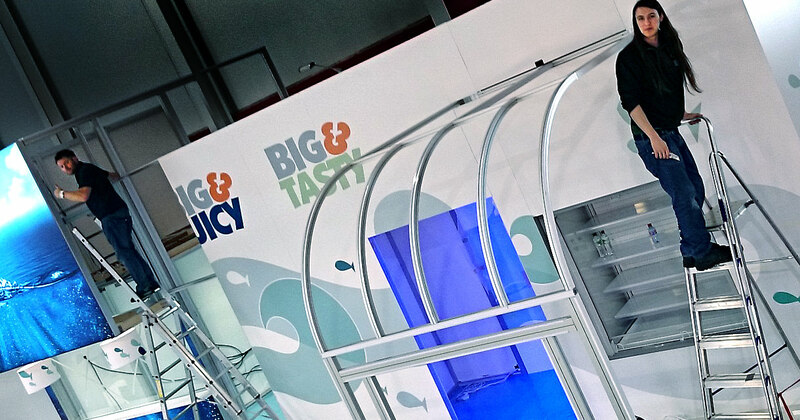 The fish printed lampshades were a new subtle addition to the stand and the attention to detail didn’t go unnoticed; it was a huge success with the people at The Big Prawn Co and the stand couldn’t go unseen with the large illuminated image above the meeting room. With our Exhibition service, we try to make everything as easy as possible for the client. We offer a full range of services from planning and design to print and building it on site (we even return to break it all down again too!). Flooring, electrical services, stand design, delivery and installation are all part of the package for Big Prawn. They literally arrived the day before the exhibition to dress the stand and fill the display freezer with products and prawns. Easy! The images and video were shot by one of the team on their mobile phone before handover to the client. There’s still plastic on the floor and the fridges & freezers are still empty, but this doesn’t dull any of the impact the impressive 40sq meter stand has.